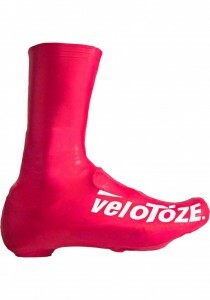 veloToze™ shoe covers are made of a flexible, lightweight material that is waterproof, windproof and aerodynamic. Because of the unique, patented design, they don’t have vulnerability points like zippers or velcro. They are also light and compact, folding up to the size of a spare tube, which allows them to easily fit in a jersey pocket or saddle bag. The company is founded by a team of loyal cyclists in Sonoma County, California that wanted to ride regardless of the weather. But when they tried the different shoe cover options currently available on the market, they found that none of them kept their feet dry, even in light rain. They also found that they got heavy when wet, were bulky and were not very aerodynamic. veloToze™ is a Sonoma County, California based company. The Tall and Short shoe covers for cyclists are the company’s first products. The company was founded in 2014 by brothers Joe and Danny Feng. They partnered with Nick Kersmarki and Kristine Weeks who worked together at CamelBak® and have sales and marketing experience in the cycling and outdoor industries. Adrian Tamblin who is also an avid cyclist was recently brought on for his web, social media and photography expertise. Consumers – Visit our store finder page to locate your nearest veloToze stockist.